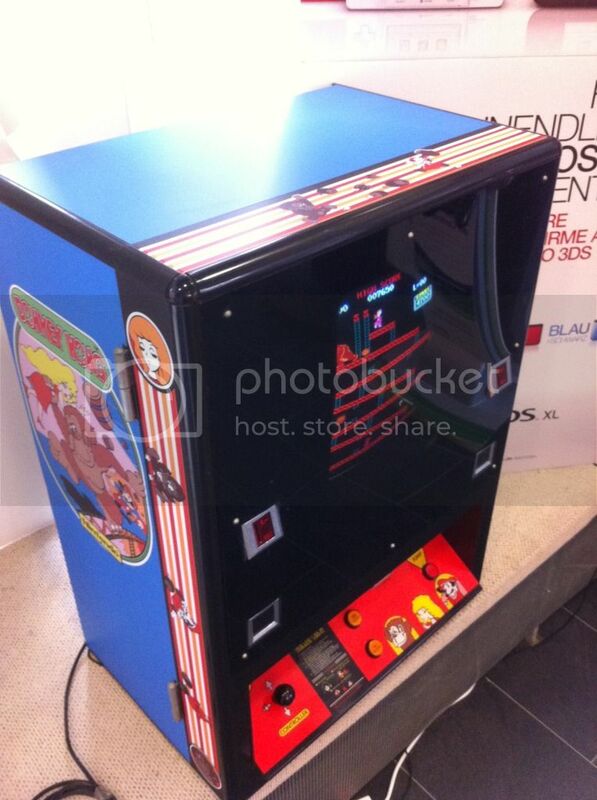 I have a spare and very nice all original Nintendo Donkey Kong. Anyone wanna trade for a Zaccaria Crazy Kong? I guess your PM box is full by now. I am repro-ing the sidearts and have a scan of the bezel. one is Original Falcon , the otherone is a bootleg. Getting the Nintendo cab over here is not the problem (any more), but how to get the CK to USA? I will never forget the sight of rows of dozens or maybe even hundreds of Zaccaria cabs, even stacked ontop of one another when we first visited a big wholesale/used games dealer. Well, as far as I know many were imported to eastern europe etc., but I am not sure on that part. What I know for sure is that the rest became ashes when the huge warehouses burnt down to the ground. Even sadder when I think of all the non Zacc dedicated cabs that burnt as well. I have (2) ORCA Crazy Kong boards. Are those any good? My friend is making me a JAMMA adapter. I thought about making a CRAZY KONG cabaret. Wouldn't that be cool? we are doing a highscore savekit for Crazy Kong with highscore-upload, too. I really want this one for my own little baby.. pretty much my very first project ever. it has a crazy kong board in it. not as cool as a zaccaria crazy kong though. Nope! No one took me up on my offer. Are the dedicated Zaccaria Crazy Kongs rare in Europe? The smaller ones pop up 2-3 times a year here, but never saw the full upright with the bended marquee (except mine). About the Ck pcbs, I try the find all my boards and make a pic from all variants. If I remeber right, the colours are different in some versions. it does not have the bezel though, thats why i think its converted..